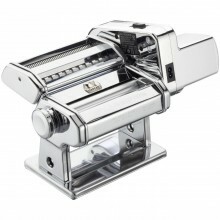 This is a combination package that consists of the Atlas 150 pasta maker with the Pastadrive motor attachement. Atlas 150 is absolutely the most versatile Manual Pasta Machine available on the market today and also the most widely sold. A complete system of attachments applicable to the body of the machine allows for obtaining more than 15 types of different Pastas: from Spaghetti to Ravioli, from Lasagne to Angels' Hair (Capelli D'Angelo). The Standard Machine is comprised of the Body with Flat Rollers for making the Dough Sheet and an easily removable Double-Cutter. The standard Cutters are in the following sizes: 1.5mm for Tagliolini and 6.0mm for Fettuccine. Included in the packaging is a 12 page Booklet with Color Photos, Detailed Instructions in Various Languages and some Basic Recipes. The machine is packaged in a sturdy, 5-Color Lithographed Box and is Guaranteed for 3 years. The body of the machine is entirely made of Nickel-Plated and Chrome-Plated Steel for long-term resistance to corrosion. The Rollers are of special Nickel-Plated Steel (Nickel-Plating 6 µm thickness) with Double-Slotted Opening for Insertion of the Handle and Motor Unit. All of the gears are in case-hardened and tempered steel for extra-long life. The opening between the Flat Rollers is controlled by a Numbered Regulating Knob with 9 positions (from 2,5 mm to 0,3 mm). The Handle and Clamp are included in the packaging and have hand-grips made of ABS. Click the button below to add the Atlas 150 Pasta Maker and Motor Combo to your wish list.